If you have a good moveset for Kommo-o, post an answer below and upvote the best ones. Remember, this is for competitive movesets, not in-game. Ability, EVs etc should be included, and we encourage sets for VGC doubles as well as singles. Make sure to read all the guidelines here. Kommo-o Pokedex & learnset for reference. Clanging Scales is a nice move. No annoying SpA drops make it a bit more spammable than Draco Meteor. Flamethrower hits Steel types with more accuracy than Focus Miss, and Flash Cannon hits all the Fairies running around. Got one with almost same set, mine has a Modest nature and 4 EVs into HP instead of Def, and I like more Kommonium Z as it doesn't lock me into one move, though I do feel that his SpA could be better..
Dragon Dance is a must on him to allow him to be a fast physical sweeper. It may be difficult to set up, but Kommo-o may force a switch against something it checks against. Focus Sash is there to Ensure that he makes a move before being KO'ed. Overcoat is a great ability for Kommo-o as when he hang on to Focus Sash or has few Hp left, he won't be affected by the weather. Bulletproof and Soundproof are options if you would like the immunity to moves like Shadow Ball or Bug Buzz. Outrage is STAB, so does Dragon Claw which is more reliable. Sky Uppercut is STAB, but Brick Break is an option if you want to break through Refects and Light Screens. Earthquake and Poison Jab are coverage. A decent Strategy for setting Dragon Dance's is as always getting someone to make a Substitute for you in Doubles/Singles, that's how I do it atleast to be able to get 2-3 off before going haywire and start 2HKO'ing/1HKO'ing everything. The Point of this set is maximise the use of Kommo-o's Special and Physical attack Kommo-o's Kommonium Z Will Allow No Only For Free Stat Boosts But Can also OHKO Garchomp And Mega Salamence (But However Kommo-o's Trainer must Predict When Either One Comes in before using it) Drain Punch is to OHKO Tyranitar and Weavile. While Close Combat OHKOs Hydreigon, Mega Kangaskhan and Heatran. Earthquake is to OHKO Gengar, Magnezone and Salazzle While Fire Punch Is Used Against Steel Types that are Immune or Take Neutral damage from Earthquake Like Scizor, Skarmory, and Ferrothorn. Lastly Poison Jab OHKOs Tapu Bulu and Whimsicott and KOs fairy Types That have been Weakened. 224 EVs In Speed Lets Kommo-o Ensures it can Outspeed and Pokemon With a Base Speed of Under 80. Soundproof is to Block Other Kommo-o Using Clangorous Soulblaze and Swampert's Roar. If you want just a brute sweeper, then go for Swords Dance. However is you'd rather have it more balanced, then do Dragon Dance. Now, Brick Break has better accuracy but lower power, while Sky Uppercut had worse accuracy, but more power. I should also mention that Brick Break disables the Light Screen, or Reflect if one is up. So that could come in handy. Next, if one of your teammates/pokemon has Spikes, or Stealth Rocks, then Dragon Tail for sure. But if you don't, Dragon Claw is a great physical STAB move. Finally, Poison Jab. Haha, yeah... this is a must. Kommo-o's attacks and defenses are pretty even naturally, so adding to the bulk can allow it time to set up against the opponent. The Weakness Policy will strengthen its attack as long as it's hit by a super effective attack, and if Kommo-o is made into an all out attacker, the Assault Vest can be used, because most of Kommo-o's weaknesses are special attackers, so the Assault Vest makes it easier to survive the attacks. Sky Uppercut and Dragon Claw are good damaging attacks and provide STAB. Earthquake is type coverage. Swords Dance can raise the attack stat, so Kommo-o can sweep easier. Dragon Dance can also raise attack (Not as much as Swords Dance) and raise speed to help Kommo-o out speed its opponents. Poison Jab can be used to deal with the Fairies. First time posting a moveset, I'll try my best tho. This set foccuses on going in, taking 1-3 enemies and then retiring, a reason why I maximized Atk and Spe obviously, you want to act first, take advantage of the solid Atk Stat he has, Buff it up with a Single Swords Dance and then select a Outrage for a STAB, Reversal for a Stab when low HP and EQuake for covering Electric Types or Rock Slide for Flying, although he shouldn't have much problem at KO'ing anything after he gets one Swords Dance out as his damage skyrockets. Bullet Proof is to protect him from some moves that could cause trouble, Overcoat if he is in a Weather Comp (Which should not be the case actually in my honest opinion), Soundproof should be kinda disregarded as there is not much "sound" moves in the game that are abused, but it's always an option too. Careful nature for more SpD, which is to balance out his defenses, Weakness Policy is amazing to keep his offensiveness if you wish so, he becomes a great wall with a high damage output, slower than normal, but when he hits oh boy it hurts, Brick Break for passing through Protects and those kinds of stuff and Dragon Claw for dealing with other Drags and having another STAB, Counter is a great move overall, and as you probably won't go to low HP lands too much with this EV Spread then you can use more Counter's, Reversal is only good if you often find yourself with Low HP obviously and that is something that happends A LOT if you run the first Set, EQuake and Rock Slide for same reason as before, coverage, Dragon Dance here is better than Swords Dance, as you can often get 2-3 of these and go for a high Damage, High Speed and High Resistances Kommo-o, you basically get all the stats you need to survive and act fast while dealing damage. I put Leftovers for the item there for those who want consistency, it's not always that you'll get hit with a Superefective move to activate Weakness Policy, but I personally prefer the damage over the Sustaining Capacity, taking other Supportive Healer with you helps at staying long periods in the fight and building up Dances to come out and deal a mass of damage, sometimes even OHKO'ing enemies or 2HKO'ing them with DC or Brick Break/Counter. ATTACK POWERHOUSE! 1. Use Belly Drum (max. attack, but half health) 2. KO Opponents using best move and Heal 1/8 of what you dealt out. 3. Sweep and win! Here Kommo-o is an all-out attacker with no consideration for defense, useful for taking out one stubborn enemy Pokemon that just won't faint. First use Belly Drum to max his attack, then use Outrage or Brick Break depending on type matchups. Poison Jab is, of course, to get rid of enemy Fairy types as soon as possible. Explanation: This is a Good Belly Drum-Salac Berry Sweeper set. The Ability Soundproof is Better than Bulletproof and Overcoat (HA) because You can't get Roared out of Battle. Substitute helps Set up A Belly Drum. Belly Drum raises Attack fully to 6 stages. Sky Uppercut or Brick Break is your choise of Fighting STAB. No Second Effect or get rid of Screens on the Foe's Side. Your 4th move can Be Dragon Claw for STAB, Poison Jab for Fairy coverage or EQ for All-around coverage. So with Ultra Sun & Moon's release, Kommo-o now has access to Close Combat as well as Iron Head (for Fairy and Ice coverage). I would keep Dragon Claw as well as Earthquake (or shadow claw if you're afraid of psychics like me). I use this set as a Lead in Monotype and its job is to just get a KO before being KO'ed, so the set's might change a bit (use dragon dance). Dragon Claw and Sky Uppercut are STAB (Obviously) while Poison Jab is there to Murder fairies, Swords Dance is there as an option if you can. As I said before This is a lead Kommo-o set so don't spam downvote because you sent this Kommo-o last and got Rekt by brave bird. It is designed to have fallback Pokemon. So with Autotomize we out speed threats like Flygon. Close Combat is STAB and wrecks everything, never even knew Kommo-o got Close Combat! This guy is so OP that I did thousands of sweeps (with some back ups, of course...). You may think Weakness Policy is not very good because he has *4 weakness is Fairy-type. So, what I recommend is a Pokemon that can use Reflect and Light Screen. What Pokemon depends on you (I use Klefki because it has Prankster). Pokémon: Kommo-o. Item: Kommonium Z-(if you have to use this, like when a Fairy type is in your opponent's party, then use it even if it's not very effective because it raises all stats except evasion and accuracy by one stage and you won't get a chance to use your Z-move when the Fairy type comes). Ability: Bulletproof-(with bulletproof you are not affected by ball and bomb moves, as well as some cannon-based and blast-based attacks. Moves you're immune to: Acid Spray, Aura Sphere, Barrage, Beak Blast, Bullet Seed, Egg Bomb, Electro Ball, Energy Ball, Focus Blast, Gyro Ball, Ice Ball, Magnet Bomb, Mist Ball, Mud Bomb, Octazooka, Pollen Puff, Rock Blast, Rock Wrecker, Searing Shot, Seed Bomb, Shadow Ball, Sludge Bomb, Weather Ball, and Zap Cannon). EVs: 102 HP / 104 Atk / 100 Def / 100 Sp. Atk / 104 Sp.Def. IVs: Hyper Trained/31 in all IVs. - Clanging Scales-(STAB and signature move. Dragon type coverage. It would be best if you use this after your Z-move). - Close Combat-(STAB. Normal, Ice, Rock, Steel, and Dark type coverage. It would be best if you use this after your Z-move). - Poison Jab-(Fairy and Grass type coverage). - X-Scissor-(Psychic, Grass, and Dark type coverage). Any move or type in bold text (exclude the moves you know), are the moves and types you're weak to. How come it isn't all special? It already has Clanging Scales, just give it more special moves like, Focus Blast, Flash Cannon, and other special moves. Focus Blast misses, all the time, you can't depend on it. Flash Cannon can't poison you like Poison Jab. 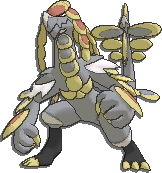 This Kommo-o isn't meant to be all special. What special move can Kommo-o learn that is super effective against Psychic types? If Kommo-o could learn Aura Sphere (which it can't) maybe I'd consider a special Kommo-o. There's nothing wrong with Kommo-o being mixed because it's z-move raises all it's stats (exclude evasion and accuracy) by one stage which is very good for a mixed Kommo-o. When I say mixed I mean a physical and special Kommo-o. Have fun with this set! Clanging scales for the z-move drain punch for stab and good physical attack and also to get back any hp lost dragon claw for stab and good physical attack and poison jab for good physical move against fairy types and get poisonig. What are some good/easy ways to defeat the Kommo-o in the Poni Island Trial?